Joe Tursi focuses his practice on real estate and commercial litigation and transactions. 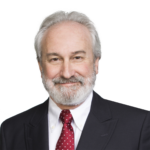 He offers his clients decades of experience litigating Landlord/Tenant disputes and unlawful detainer actions, as well as drafting commercial leases, purchase and sale agreements, in addition to other real estate issues. Joe began his career as a Deputy District Attorney where he prosecuted everything from simple misdemeanors to major felonies, including homicides, in San Benito and San Francisco counties. He further honed his trial prowess and advocacy in private practice litigating business, real estate, toxic tort, and police misconduct cases. From there, Joe found his passion for commercial real estate as Vice President and In-House Counsel for CBRE as he focused on real estate broker defense litigation. In the mid-nineties, Joe co-founded Rentschler/Tursi LLP, where he was a partner for more than 21 years. The firm focused on real estate transactions and litigation. In addition, Joe would also routinely serve as a mediator in commercial real estate matters. In 2018, Joe returned to San Francisco and joined SSL Law Firm. Joe’s experience in the public sector, corporate environment, and private practice give him a unique ability to represent his clients no matter what their position in the deal (or the lawsuit) may be.